When needed you plug that in and hit switch in coach. If it's just one end of a cord it might be for your engine block heater. Mine was unplugged from the nearby switched outlet when I got my coach. I think Bob was referring to your 'Horizon 2003 Operator Manual" in the Black Bag where you should be able to find a discussion of the engine block heater under the 'Chassis' section (at least that's where it is in the manual for my 2005 Vectra). It doesn't have anything specifically to do with your inverter. Sam,as I mentioned before, you should have an owners manual for the coach in your black bag. In that manual will be instructions on how to plug in the block heater and operate a switch you will most likely find in the area of your "One Place" wall. I had a heck of a time finding the female plug for what you described but it is there. I can't see mine but by feeling around up there I finally found it. My understanding is the chassis manufacturer delivers the chassis with this cord and Winnebago puts in the female plug with the rest of their electrics. Well.. I looked and no plug in the area.. I have a 2003 Horizon 32ft and it does not have a place to plug the cord into. I removed the cover from the inverter and looked all over the inside of the elec. compartment. I guess it is to be plugged into a extension cord ? I do have a switch in the coach that controls the Block Heater but I am wondering if it really works also. I also went through the entire Black Bag and there is no referrence to the heater plug at all. I think the dealer used this coach as a source for missing items on other coaches while it sat on the lot. I had a lot of small items missing when we bought it . Thanks for your help. You could even email Bryan Funke,a service lead with Winnebago who participates in these forums. GREAT guy....will return your email. I have an '02 Journey. The female receptacle is VERY hard to find. I had to use a mirror to find it, as it faces the rear of the compartment, and is the same dark color as the case. This has nothing to do with the inverter, so do no look there. The receptacle is controlled by the switch in the coach. Thanks for the description. I will get a mirror an take another look. Thanks for all the information. The good news we have found the plug for the block heater ! It was hidden behind the outlet box for the cable and tele. hookup. My wife practically had to climb inside the small compartment to see it ,but it is there just as you described. This has me wondering if this is nothing but a switched 120volt outlet from the interior of the coach via the Block Heater switch ? If this is the case, could I not use it as source for outside lighting, battery charger etc.? Thanks Oh-one out. Location: Medford, near Boston, Ma. 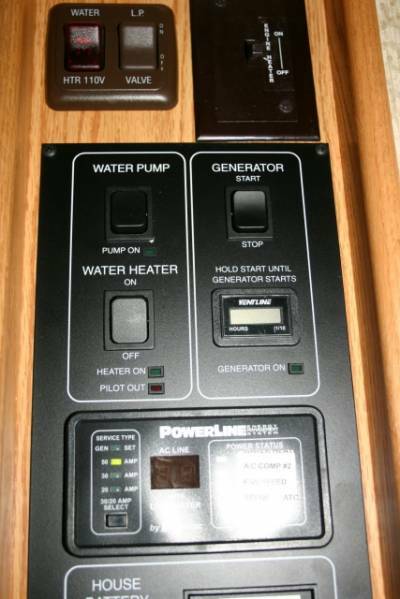 Have the same 120 volt outlet for block heater in same bay with 50 amp shore power cord with a on/off switch on monitor panel inside rig. I leave the block heater unplugged because no power where store rig and use this outlet for several tools etc.